October 9, 2012 - WACO Classic Aircraft, the FAA certified manufacturer of the world's most desirable open cockpit sport biplanes, announced a groundbreaking achievement on Monday, with the FAA approval of the S-TEC System 55X autopilot STC for installation in the WACO YMF-F5C and 5D. WACO will now be able to offer an autopilot installation in the aircraft, which will help improve the safety of flying and lessen the workload for the pilot by offering altitude preselector, flight director and electrical trim system. The first installation in the field is in our factory demo plane, which is scheduled to attend the AOPA Aviation Summit October 11-13, and can be seen there. Demo rides can also be arranged. 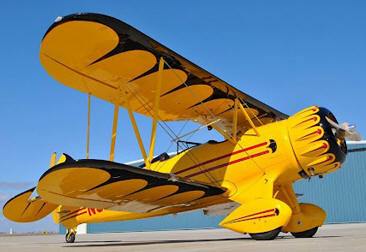 WACO Classic Aircraft is the world's preeminent manufacturer of Sport Biplanes. The company currently builds the three-seat biplane, the WACO YMF-5D, based upon the original manufacturing plans, updated to modern safety and avionics systems, and also the Great Lakes 2T-1A-2. The aircraft are constructed on the airport at the W.K. Kellogg Regional Airport (KBTL) in Battle Creek, Michigan. WACO Classic Aircraft also operates a repair and restoration subsidiary that specializes in historically significant vintage aircraft. In 2010, the company announced the improved YMF-5D version, powered by a Jacobs 300 h.p. engine and featuring numerous updates. The 'F' series was popular with private owner pilots for sporting and other uses and continued in production through the late 1930s. The tandem cockpit UPF-7 version was adopted by the Civilian Pilot Training Program and continued to be built in numbers (over 600) until 1942. The YMF of 1934, which had a modified wider and longer fuselage, was returned to production in March 1986 by WACO Classic Aircraft of Lansing Michigan as the YMF-5. Over 100 YMF-5s have been completed by WACO Classic Aircraft and the type remained in low-rate production to customer order in 2012. WACO Classic Aircraft Corp. is a family-owned American company, with owners Peter Bowers and Jon Bowers, and a talented team of craftsmen continuing the tradition of building the finest sport biplane in the world.